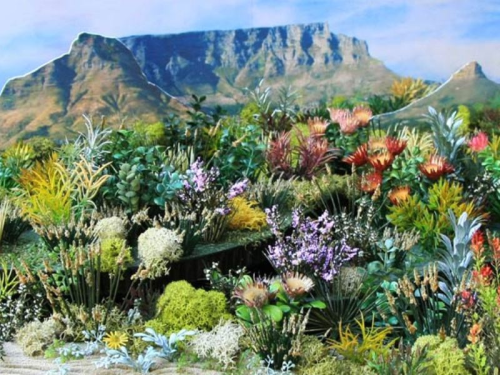 The Cape Floral Kingdom of the Western Cape forms one side of the display. The 2011 SA-Kirstenbosch Chelsea Flower Show exhibit has been saved and will now go ahead thanks to the generous sponsorship of the Provincial Government of the Western Cape (PGWC) and the SA Gold Coin Exchange. The South African National Biodiversity Institute (SANBI) confirmed that the 35 year run of exhibiting at this prestigious event will not be broken and the display will be heading off to London to the Royal Horticultural Society’s (RHS) Chelsea Flower Show in May. The Western Cape Agriculture MEC, Gerrit van Rensburg, speaking on behalf of Provincial Government, said that when he heard that SANBI had not managed to raise the funds to showcase our unique South African biodiversity at the Chelsea Flower Show for the first time in over 35 years, he engaged his colleagues to raise the funds between their departments, to make it happen. This display is inspired by two of South Africa’s Heritage Sites. ‘During 2010 there was not a country in the world that was not exposed to the beauty and excellence of South Africa. But we cannot rest on history. We must keep our uniqueness out there in the world’s eye,’ said van Rensburg. 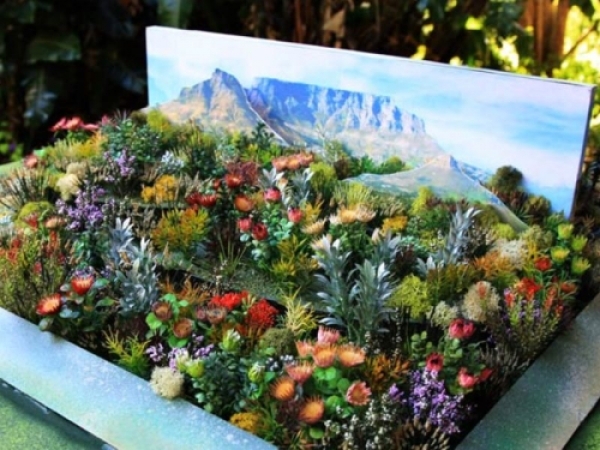 The SA – Kirstenbosch Chelsea Flower Show exhibit is an important element in gaining support for Table Mountain to become one of the seven wonders of the world. In addition, as a showcase of our design talent, it reinforces Cape Town’s Bid to become World Design Capital 2014. The Western Cape’s commitment to sustainable development and building on the advantages of the emerging green economy is showcased through this project. With all of the above in mind Alan Winde, MEC for Finance, Economic Development and Tourism, and Anton Bredell, MEC for Environmental Affairs and Development Planning, have shown their full support underlining the importance of this project. Co-sponsor Alan Demby, Chairman of the SA Gold Coin Exchange and The Scoin Shop welcomed this public/private sector partnership; ‘As a business operating in both South Africa and the United Kingdom through our unique SCOIN shops, sponsoring this exhibit made huge business sense. There are so many synergies. Celebrating our floral heritage has been a major feature of the PROTEA gold coins since the SA Mint brought out its first coin in the PROTEA series in 1986, celebrating the centenary of Johannesburg. Over the years, Bafana Bafana, the new Constitution, the Cape wine industry incorporating Table Mountain and other sectors in South Africa’s heritage have been featured. Our ten years of democracy commemorative Gold Coin that features Nelson Mandela on the head and the king protea on the reverse is one of the most popular coins ever produced. Since its release in 2004, it has become seven times more valuable,’ he said. 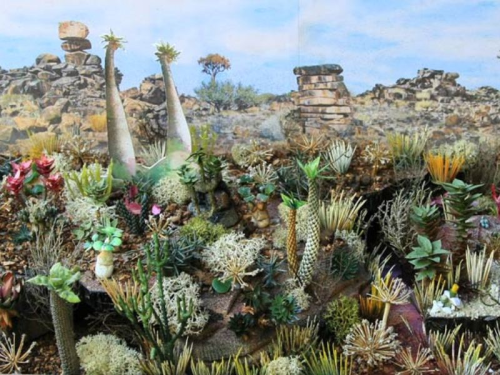 The arid, mountainous desert of the Northern Cape’s Richtersveld region where 650 plant species have been recorded makes up the second half of the display. ‘Our SCOIN shops are the only retail chain of coin shops in the world and were a finalist in the international retailer of the year competition. If our designers bring back gold from the Chelsea Flower Show the SA Gold Coin Exchange and its SCOIN shops will be giving them each a gold Nelson Mandela medallion,’ he continued. The RHS Chelsea Flower Show runs from 23 to 26 May in London and this will be the 36th year that South Africa has been represented. The Kirstenbosch-SA Chelsea Exhibit has always done the country immensely proud – having won 30 Gold medals, two Silver-Gilt medal and three Silver medals. It was also awarded the Wilkinson Sword trophy for the ‘Best Overseas Exhibit’ on all four occasions that the trophy was presented, and has won numerous other awards for outstanding contributions to the show such as the Tudor Rose Bowl, The Lindley Medal, the Lawrence Medal for the ‘Best Exhibit shown to the Society’ in 2006, and the President’s Most Creative Award in 2008.